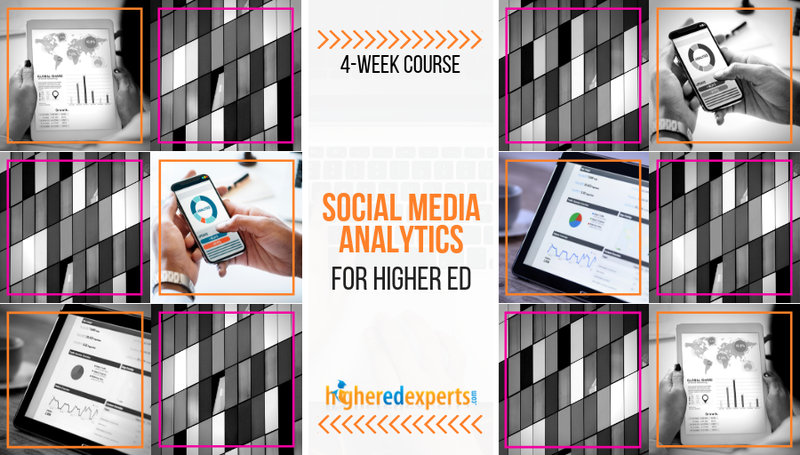 Focused more on action than memorization, this course will guide you through the creation and implementation of your measurement process for your social media efforts using the Higher Ed Digital Marketing Analytics Roadmap (HEDMAR) Framework. Why have many higher ed pros taken this course — and why should I? Several of your higher ed colleagues have developed their social media measurement practice by taking this professional certificate online course from 2015 to 2018. This course on Social Media Analytics for Higher Ed was really good, but everybody was ready for a fresh approach. So, we decided to make it even better for you! The redesign of this course (launching in April 2019) was informed by student feedback, changing analytics practices, learning and cognitive research, but also shrinking attention spans and increasing demands on your time. Do I really need to take this course on Social Media Analytics for Higher Ed? Are you in charge of social media, but feel overwhelmed by all the analytics reports? Do you need help to measure what matters to demonstrate social media value to your boss? Do you want to make data-driven decisions for social media at your school? This 4-week Social Media Analytics online course has been designed (and redesigned!) 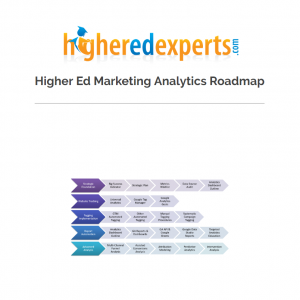 to help you design and implement a comprehensive social media measurement plan as part of your higher ed marketing strategy, so you can better inform the social media strategy of your department, division or institution of higher education. What will I learn about Website Analytics for Higher Ed? Should I take this course on Social Media Analytics for Higher Ed Course? Recognized certificate of achievement in social media analytics for higher ed upon completion of the course with a final grade of 80% or more. Being new to various ways of analytics and measurement, and not having a solid social media plan in effect yet at my organization, I did find this course challenging but super helpful. It opened my eyes to so much I didn't know and gave me a great deal of information in a short amount of time to begin crafting what we want to do and how we want to use our social media platforms. I love that post the course, I still have access to the materials we covered, so my efforts can truly be a work in progress. If you are looking to understand how to establish a social media measurement and reporting system, this is a great way to get started. Fantastic class! Thorough, challenging, and immediately actionable. As someone new to social media management, this course will allowe me to track metrics that matter and better communicate social media program goals and accomplishments with colleagues and administration. I liked that the course assignments were designed to produce hands-on, real-life documents that will be helpful to our department. This was a great introduction to measuring my social media efforts! We started with the basics: how to design a social media program with measurable goals; then expanding from that solid foundation with an exploration of tools to assist in measuring goals; all the way to designing a social media report. Each step gave me the opportunity to develop something I can use in my professional world, through the weekly discussions and assignments, with substantive feedback from classmates and the instructor on how to improve. I would definitely recommend this social media measurement course, to anyone looking to hone their analytic reporting skills. With so much information available from so many sources, it is important to get the information about what is available and have the support system of other professionals like yourself to figure out what is applicable to you and your institution. I would recommend this course to anyone! I learned how to define my social media goals and how to measure our successes. This course has also helped me talk about the importance of measurement with my colleagues. This is my 3rd Higher Ed Experts course. I keep coming back for more because these courses are highly applicable to my job. I am able to take the skills and knowledge attained and use them immediately in my work. If you are at all new to the use of social media in higher ed, this is the place to start! My instructors are well-known in the industry and stay current on the latest trends. I would absolutely recommend this course. It offered me a great deal of knowledge I didn't have before, and it also helped shape a way of looking at metrics and social media I didn't see before. Being able to explain the value of our social media work is important, and this course will help get you there! This was a fantastic class. I loved everything about it. As always, there's an investment of time needed, but it helped tremendously with my own work and produced immediate results and improvements for me. It seems that every time I take a Higher Ed Experts course I am surprised by its timely relevance to my daily work. And, then I realize, it's no coincidence, it's just that HEE's course content is so up to date and relevant that it can't help but be applicable in everything I'm doing at work! It's really easy to fall into the trap of underestimating the importance of strong social media objectives. Too often we post content 'just because', without it feeding into a wider strategy. This course forces you to examine your social media programme and properly think about the reasons you publish certain types of content and how you can measure success. It's definitely encouraged me to develop social media objectives that are more strategic and will benefit the wider university. This course was a good amount of work but it will spark your interest in social ROI even if this is your first experience with diving deeper into insights and analytics. I highly recommend this course for anyone who feels like they are just pushing social content out all day/week and not sure how to determine if any of it is worth your time and effort. Interacting with others who work in similar roles was really great. 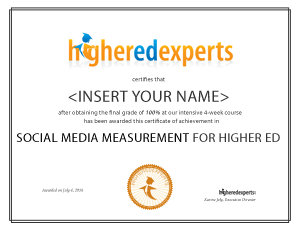 This course in higher ed social media measurement was incredibly useful for me. For a long time, I've struggled with exactly what to measure and how when determining the success of my efforts, and this class clarified much of that for me. I'd highly recommend this course to all who've ever wondered if they're doing social media "just because." There are much better justifications for our efforts in higher ed social media, and this course helped me determine what many of those are. This course has forever shifted the way I look at my role, not just as a social media manager, but as a professional. I have learned skills in this class that go well beyond understanding metrics and measurement and will help shape the way I do whatever job I find myself in, no matter the industry. 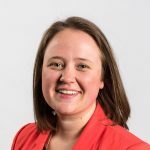 This course is a must for people working in any type of social media manager/digital strategy role in higher education; you won't find anyone better than Liz Gross to show you the ropes. I felt lost justifying the use of social media to myself and my office. This class provided a lot more clarity around how to measure the impact of social media and communicate this to my office. The coursework was helpful. The conversation with other colleagues in the class was also useful as I thought of ways to develop my own social media content and measure its effectiveness. This course has been the simplest yet most comprehensive means of creating a well-defined line connecting institutional objectives to social media outcomes. The wheel-spinning saved by taking this course begins paying off before the course is even over.